Watchfire is a recruitment and management software application that uses GPS, voice, and text messages improve rapid team coordination. 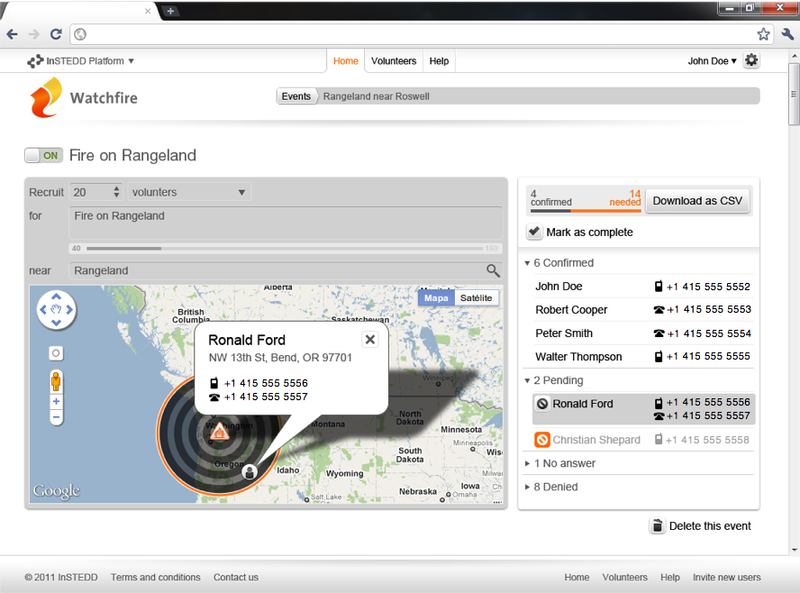 Watchfire is a simple and yet powerful system that initiates and tracks the process of building a volunteer response team with people who are geographically close to each other through phone calls and text message. In October of 2010, Cisco awarded a seed grant to InSTEDD for the development of technology designed to improve the resilience of community-level disaster response. This grant was for the development of a program to support shared safety, self reliance and situational awareness during a public crisis in the Bay Area. 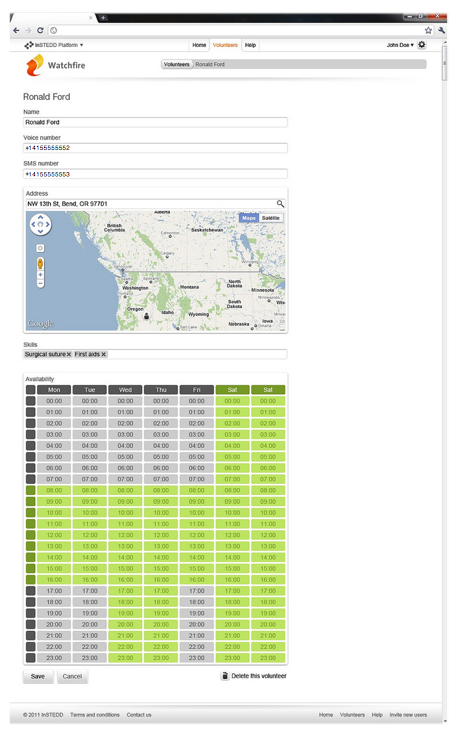 In 2011, InSTEDD designed, developed, and pilot tested a tool, called Watchfire, to help the American Red Cross(ARC) improve their community level disaster response in the San Francisco Bay Area. Working closely with the ARC on a needs assessment, we learned that their highest priority was improving the speed and coordination of ARC’s Disaster Action Teams (DATs). Using an agile development process that involved the ARC in the cycle of building better and better technical solutions, we developed Watchfire, a simple and yet powerful system that initiates and tracks the process of building a volunteer response team with people who are geographically close to each other through phone calls and text messages. For a more detailed look into the process, please read the blog post “Live recruiting of volunteers through phone calls and text messages”. American Red Cross: Effectively coordinating first response efforts can mean the difference between a relatively minor misfortune and a disaster. During an incident the Disaster Action Teams coordinator must initiate a series of “call downs” to recruit the adequate number of responders the moment that an emergency occurs. 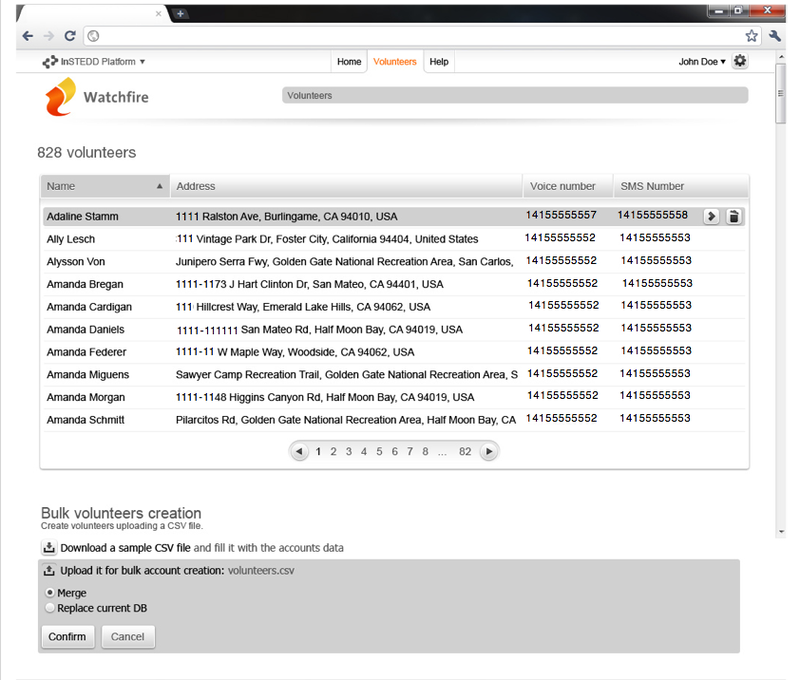 Using Watchfire, the coordinator first imports a spreadsheet of volunteer information and storing that in a database, including their location, landline and mobile phone numbers. When the DAT coordinator needs to start the recruiting process, he or she enters the number of people to recruit, the category (team lead, volunteer, trainee, etc.) and the location of the event. Watchfire then creates a calling list of the people that are closest to the event. As volunteers start responding, Watchfire refreshes to reflect the status of the recruiting process, giving the DAT coordinator a list of the people that have confirmed their availability. Any number of recruiting processes can be run at the same time, each with its own calling list, location, category and description. Watchfire helps disaster response teams to better deal with often rapidly changing circumstances and deliver the best care possible..